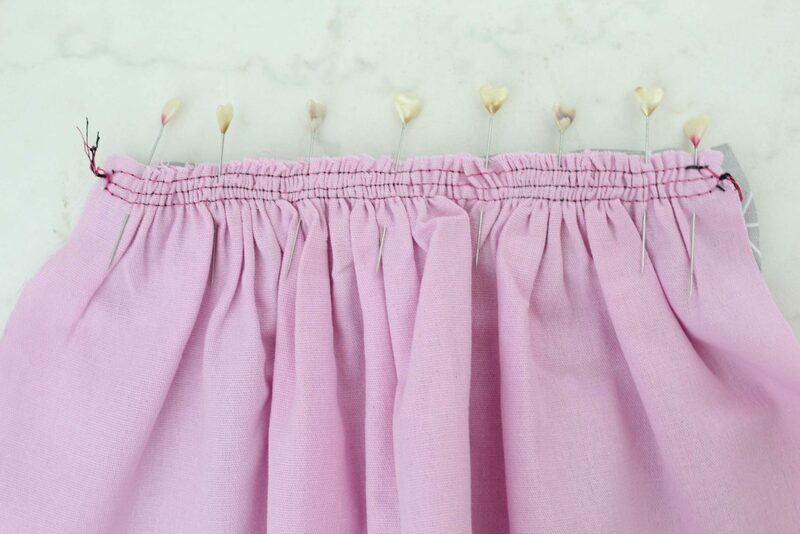 Need an easy way to gather fabric and make beautiful, even ruffles? 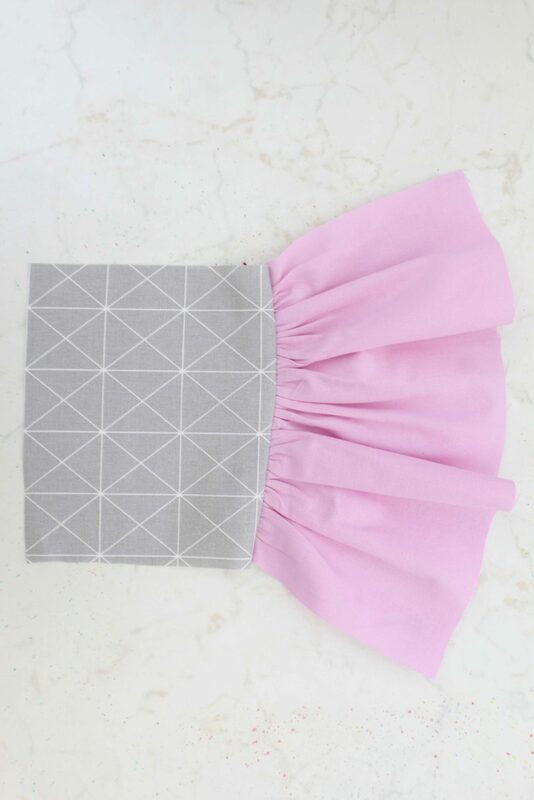 Making ruffles is easy and fun and I’ve got just the perfect method for gathering fabric! 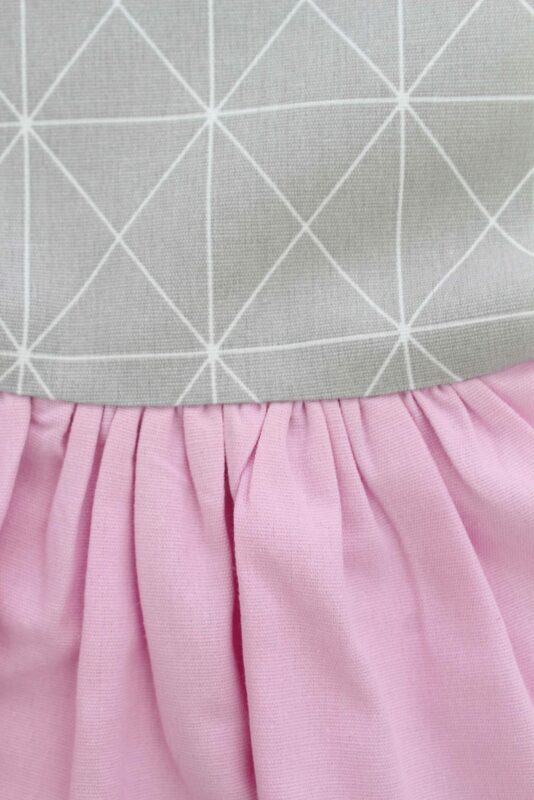 Check out these simple tips below to learn how to gather fabric the easiest way! If you’re anything like me you’ve probably tried making ruffles about a thousand times with no satisfactory results! But learning how to gather fabric and make beautiful ruffles that are even and stay put when sewing doesn’t have to be rocket science! And I’ve got just the right tools for this that I’m going to share with you today. When I made this ruffled bed skirt I promised you I’m gonna come back with a quick tutorial on gathering fabric to show you my method. I actually learn this through an accident but I’m pretty sure making ruffles the way I did is not new. 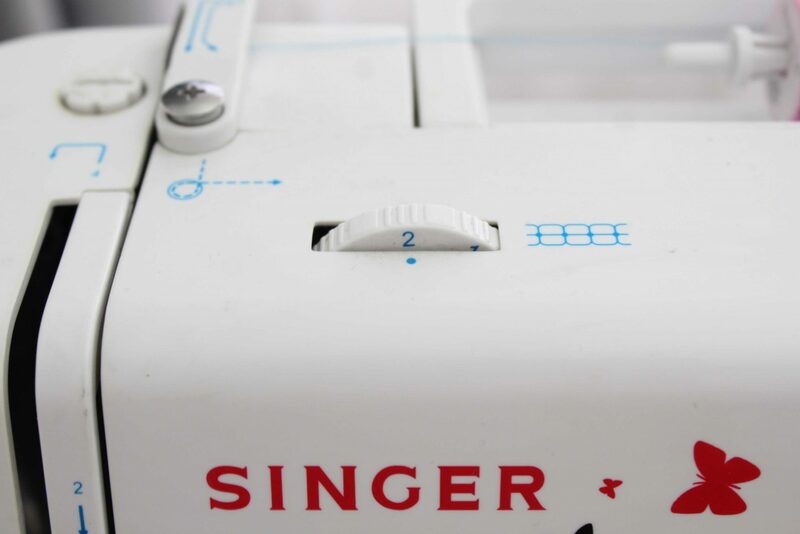 After all people have been sewing for ages nothing is really new, just maybe reinvented. 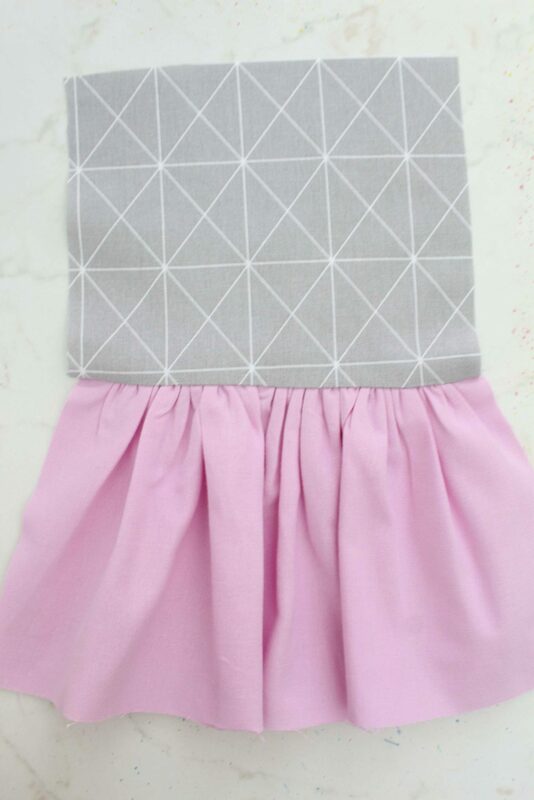 A few years back, when I first started sewing I learned how to gather fabric with my machine. I used to set my stitch length and my thread tension to the highest setting allowing my machine making ruffles automatically. The ruffles turned out great! Beautiful and perfectly even, I was so proud of them! But all that beauty went right to the pooper as soon as I started sewing the ruffles onto the main fabric. The presser foot was pushing the ruffles destroying all my hard work! So learning how to gather fabric with that method has never served me well and had to come up with a better way. 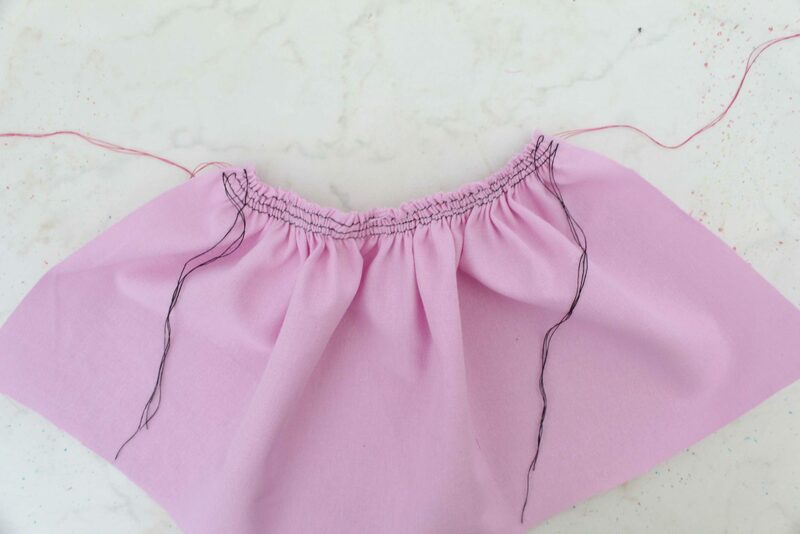 And in this tutorial I’ll be showing you how easy it is to make ruffles that are even, will stay put when sewn and also the thread won’t break when you try to spread the ruffles evenly. To make things easier to see, I used contrast thread in different colors but on a regular project, please use matching thread. Also since I haven’t included these ruffles into any garment (I only made them for the purpose of this tutorial) I haven’t paid much attention on pressing the ruffles nicely so they don’t look that pretty. Please take the time to press yours properly if you incorporate them into a piece of clothing. 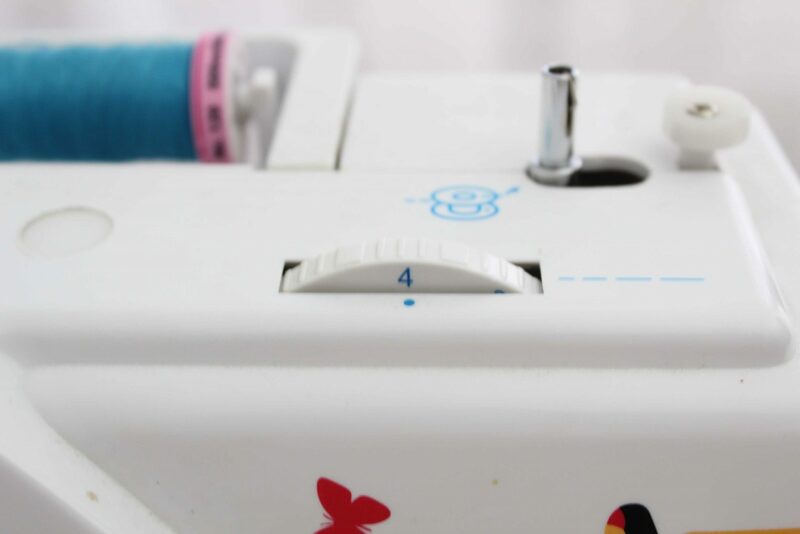 Set your machine to the longest stitch length and a regular thread tension. These were mine on a Singer 1507. 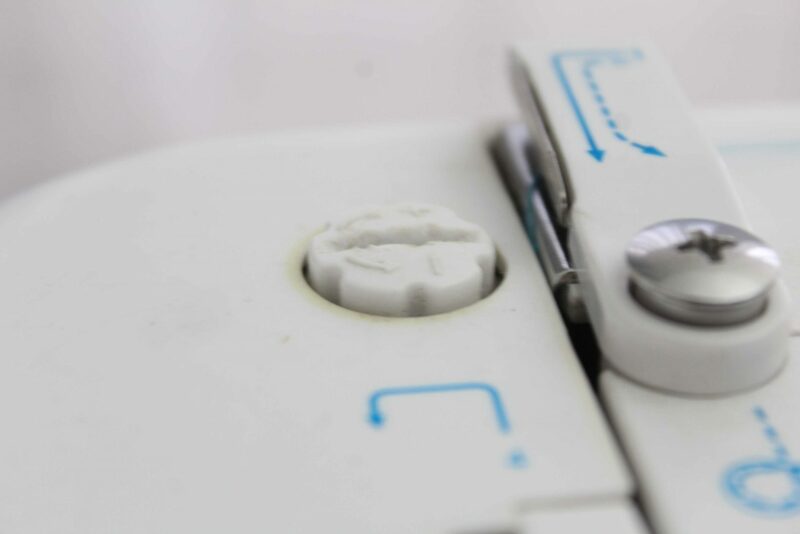 Switch the presser foot tension to a loose setting. 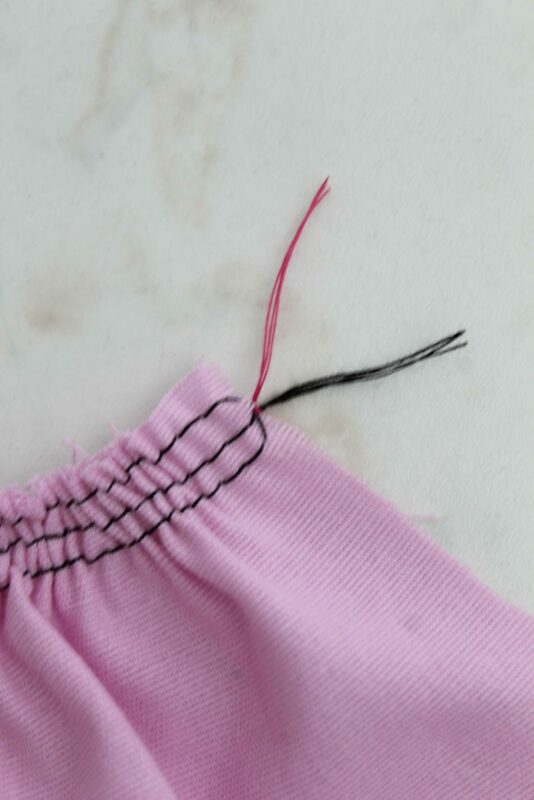 Before starting to sew, leave the threads about 5″ long. 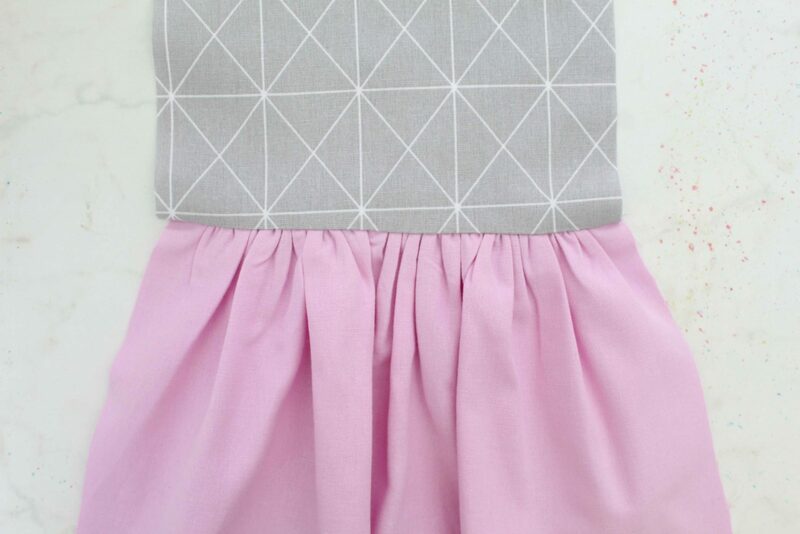 Sew along the edge where you want to create the ruffles, 1/8″ away from the edge. Leave these threads about 5″ long too. Repeat one or two more times creating two additional lines, 1/8″ away from each other. 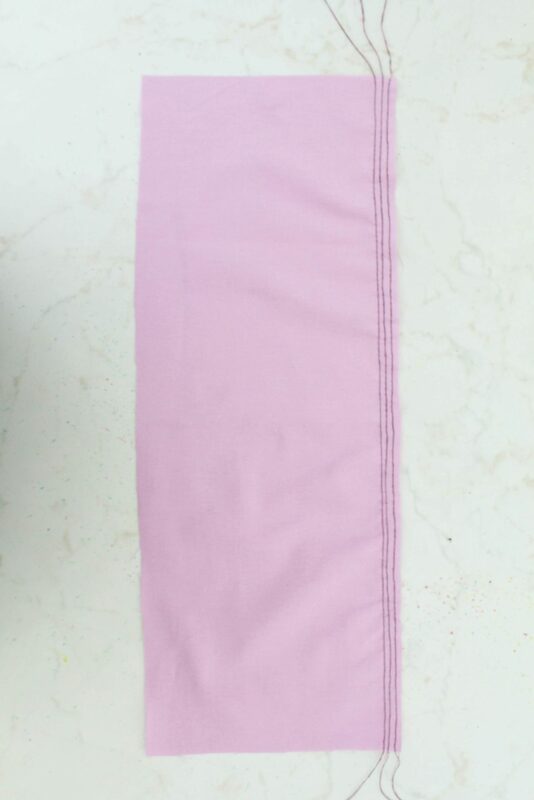 For lightweight fabrics, two lines of stitches should work fine while for thicker fabrics three rows might be needed to ensure the threads won’t break while gathering. With one hand grab all threads in the back (red in my case) and with the other hand start pulling the fabric down, gathering the fabric towards the other end of the stitches. The threads won’t break and the gathers will form and spread evenly. 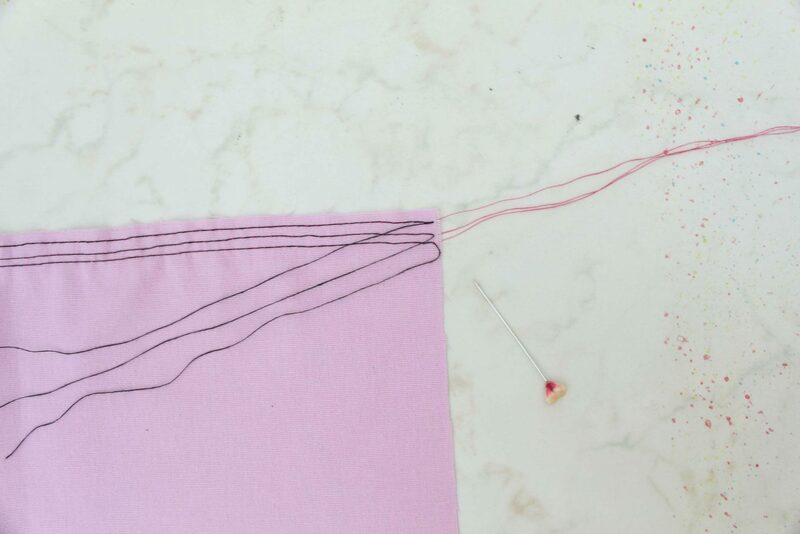 You can do this process at one end or both ends of the fabric strip. The ruffled fabric needs to match the length of the second fabric strip you’re sewing the ruffles onto. 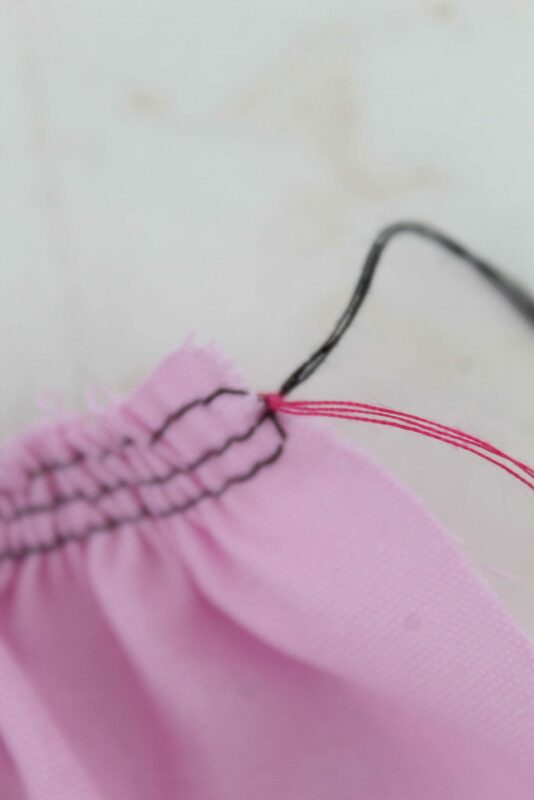 When happy with your ruffles, tie the threads in a double knot (the red threads tied with the blacks), on both ends. 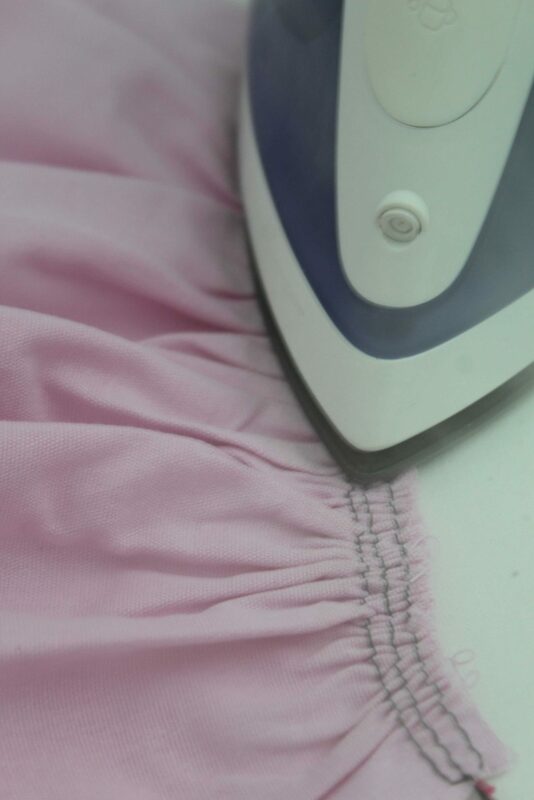 Set your iron on steam and press the ruffles very well. This is a very important step as it will be a great help when sewing the ruffles. Place the main fabric strip (the one without ruffles) right side up. Place ruffled strip over, wrong side up. Pin the two strips together using lots of pins. 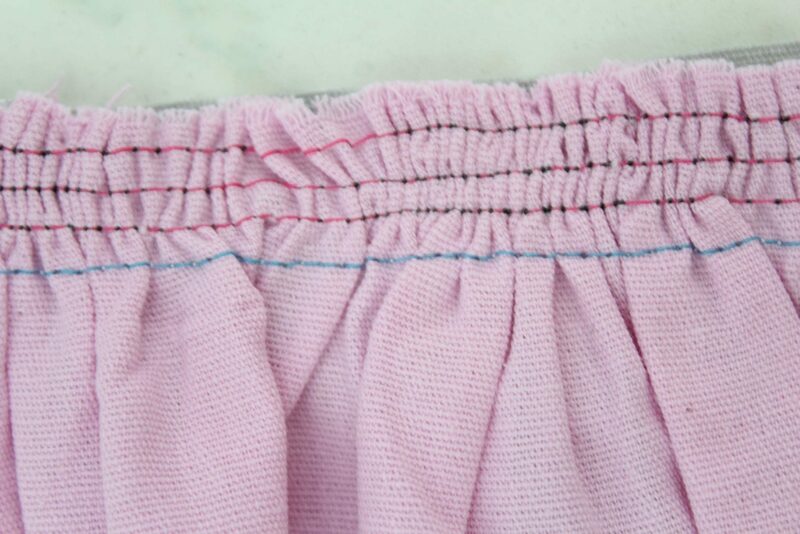 Sew a straight stitch, 1/8″ below the last row in your ruffled strip. 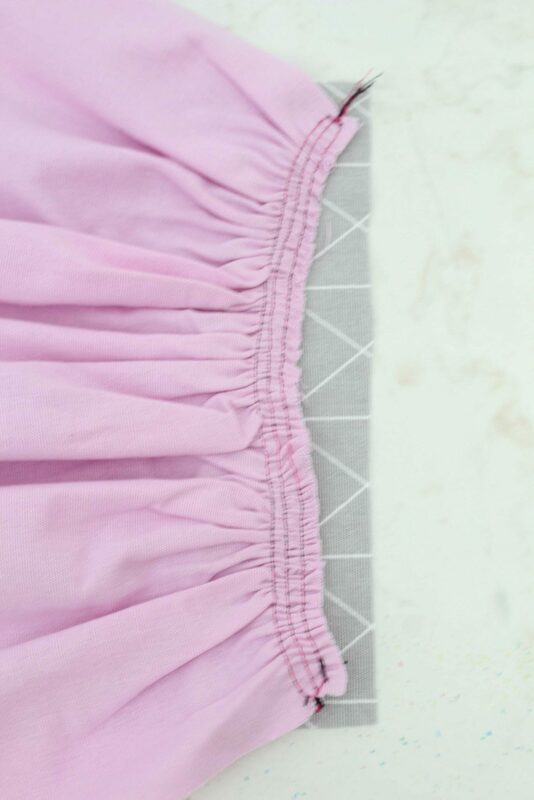 Sewing right on top of the last row would be perfect if you can; this way your ruffles will be perfectly even if you’ve spread them correctly the previous steps! Flip the ruffled strip up and press! Done! This is how to gather fabric the easiest, fastest and most accurate way!